SHETLAND’s emergency and health services are to be subject of a new BBC One documentary series which is currently being filmed in the isles. The ten-part series, which could air at the end of the year or in early 2018, will focus on how services such as the NHS, ambulance and the coastguard work in tandem in the isles. It will also look at those working in more rural parts of Shetland, including GPs and the Hillswick Wildlife Sanctuary. The series, which has a working title of Island Medics and will be shown across the UK in the daytime, started filming on Tuesday and it will continue for eight weeks. Series producer Tom Cara told Shetland News that the observational documentary series will highlight the challenges an island community faces. 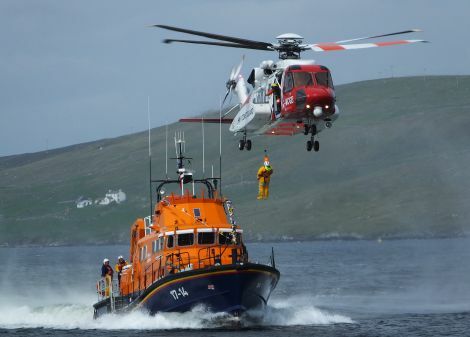 The film crew have already covered a medivac involving an ill man being airlifted from an offshore supply vessel 115 miles off Sumburgh, as well as attempts to herd a pilot whale out of Vidlin Voe. “It looks at the unique way the medical, emergency and non-emergency services in Shetland interact with each other,” Cara said. “There are some unusual things about the NHS in Shetland and the medical services in the islands. One is the kind of specialism of acute general medicine, whereby you need all-rounders rather than specialist doctors because it’s not the biggest hospital in the world – but it has an incredible selection of stuff that comes in from the fishing and oil industry, and cruise ships, of course, and life on the island. “But also there’s the way emergency services interact. Last night we were called out when a guy was taken off an oil rig support vessel was brought in by coastguard helicopter to Tingwall, where the ambulance service took him to the Gilbert Bain, and then he’ll probably be air ambulanced off. Cara said the crew also want to “capture the beauty of the islands” by covering the length and breadth of Shetland, with midwives and GPs in Unst on the agenda, as well as the Hillswick Health Centre. The series, meanwhile, is set to showcase Shetland yet again on national television. BBC crime drama Shetland has brought the isles huge attention over the last few years, while programmes like An Island Parish have documented rural life.